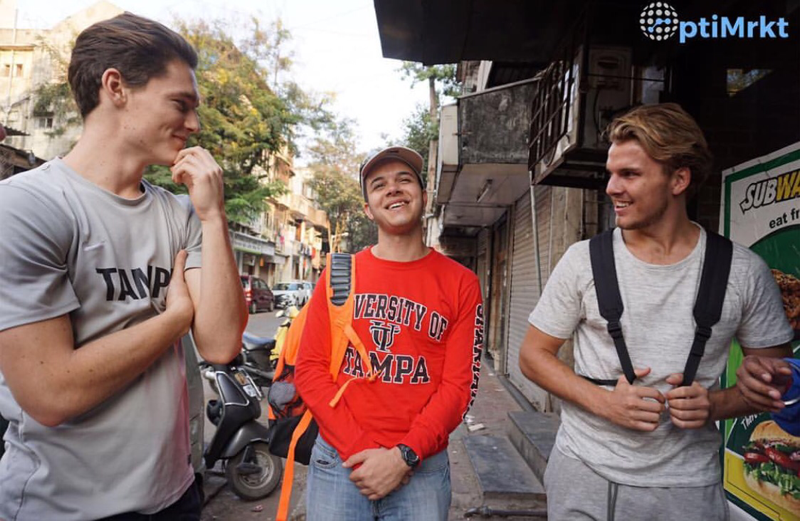 Four students went from pulling all-nighters in the brightly-lit, air conditioned Innovation and Collaboration Building to walking through the busy, vibrant streets of Darabi, India – all in the course of two months. But these students weren’t in India for a vacation. They were conducting first-hand research for their Hult Prize-winning business, OptiMrkt. Freshman Luciano Perdomo, sophomores Monty Berrow and Bay Downing, and graduate student Chenoy Ceil make up a dream team of entrepreneurs, marketers, and a lawyer. At the beginning of the fall semester, they didn’t know each other. But during an entrepreneurship club meeting, they joined forces to compete for the Hult Prize, the world’s biggest college-student competition for social change. Every year the competition has a theme, such as ending the global food crisis, fighting energy poverty, or increasing the income of people in crowded urban spaces, the theme of 2015. Students from around the world pitch their business ideas in the effort to win first place and one million dollars, which is seeded into their company. “We all came from different backgrounds, but we all have the same motivation of trying to change people’s lives,” said Downing, a sophomore business entrepreneurship and marketing major. Downing is the team’s Chief Marketing Officer and focuses on spreading the word about OptiMrkt. The mission of OptiMrkt is to help the people in Indian slums earn an additional income. The goal of those competing for the 2015 Hult Prize is to double the income of ten million people by 2022. The OptiMrkt team decided to focus on Darabi, India, because it has the biggest slum in all of Asia–it encompases 1.2 million people in an area only two-thirds the size of New York’s Central Park. Leading up to the campus-wide competition, held on Dec. 11, 2015, the four team members worked tirelessly to develop their business plan. They met every night from 8 p.m. to 3 or 4 in the morning, when Berrow and Downing would sneak in a few hours of sleep before dragging themselves to 7 a.m. practice for UT’s men’s soccer team. Their hard work paid off when they won the campus-wide competition in December and will go on to represent UT at the regional competition in Boston this March. There, the team will compete for a spot in the global finals in New York City in September. “It’s really cool to say we come from UT and not Harvard,” said Perdomo, an entrepreneurship major. The team even had the chance to travel to India in January, where they experienced first-hand the conditions they were trying to improve. After their trip, the team adjusted and polished their business plan so it would be top notch for regionals in March. They’re keeping the specifics of their plan under wraps until the regional competition in order to keep their opponents guessing. UT’s team is partnered with Tilgent Mobile Pay, a $250 million dollar mobile wallet company that is starting up in six different countries. The team also has a partnership with HSBC, the world’s fourth largest bank. As the day gets closer, the team members reflect on how far they’ve come since their first entrepreneurship club meeting and what they’ve achieved since September. Even if they don’t win the regional or global competition, the team members agree that they would like to make a difference in the Darabi slums and help perpetuate social change. They also encourage other UT students to step out of their comfort zone and apply for the Hult Prize.